Anyone else having one of those weeks where everything is going wrong and you just want the week to end? It's got to be the eclipse, it blatantly messed things up a bit. Anyway, at least I can have pretty nails while I push through the week. 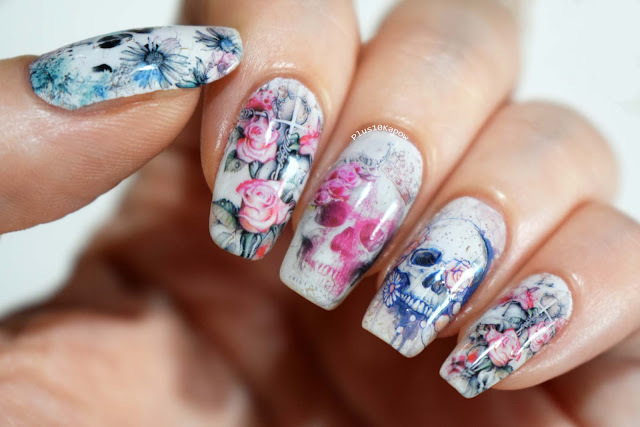 These pretty skull and roses water decals that I've got to show you today are from BeautyBigBang. In the pack, you get 10 decals, enough for one mani. They are pre-sized and square, which you know I am not a fan of, but these are slightly bigger than the usual pre-sized decals so they kind of get away with it. I managed to get them to fit on my nails, just, and they are pretty long right now. They slide right off the backing after only being in the water for a few seconds. They don't curl or fold and they stick to the nail fairly easy. 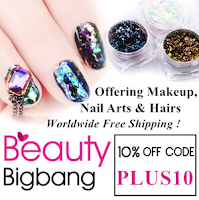 Once Seche was applied, they didn't shrink but I did notice a few little holes in the decals which you can kind of see some on the ring finger nail, they look like little brown spots, but they are only noticeable if you are really looking for them, this is still really pretty nail art. One thing that I did think was great about this set of decals is that the bottom set is actually reversed, I really like that and I hope to see that in more decal sets. 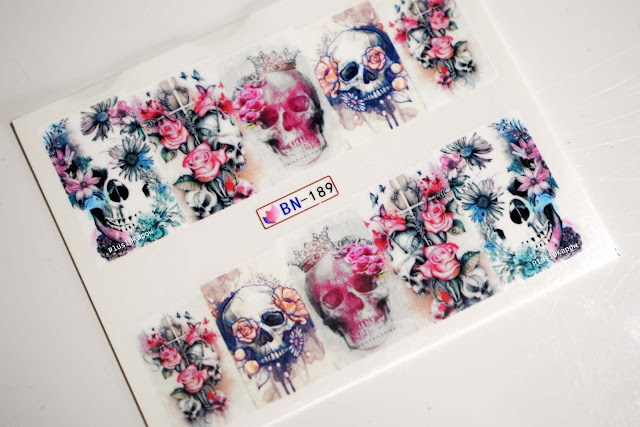 You can find these decals here for £1.24/$1.59 and don't forget that you can use my code PLUS10 for 10% off your order, just pop it in at checkout.